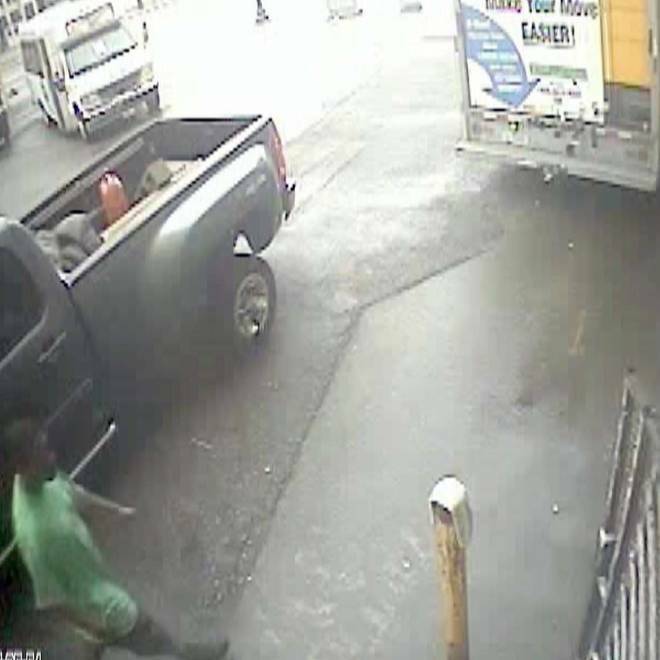 This undated image made from video provided on Monday by the Detroit Police Department shows a "person of interest" in the theft of a Secret Service rental truck carrying equipment related to Vice President Joe Biden's Labor Day visit to Detroit. Police have recovered a stolen rental truck that was carrying equipment for Vice President Joe Biden's Labor Day visit to Detroit. The U-Haul truck was stolen late Saturday or early Sunday outside the Westin Book Cadillac hotel in downtown Detroit. It was found Monday in the New Center area north of downtown, Detroit Police Sgt. Eren Stephens told the Detroit News. Donovan had said the truck had equipment on board but no weapons or anything that could put the public at risk. He declined to say whether any of the equipment was stolen. A law enforcement official briefed on the issue told the Detroit News the vehicle held portable metal detectors and that some of the equipment was missing when the truck was recovered. Biden was in Detroit to address a union rally Monday to mark Labor Day. The rally site is near the hotel.